I'm first and foremost interested in this disc because it was a version of Ronald Killette's lifetime effort "Boy/Girl Watcher." As the years rolled by, Killette placed this song with several artists, most notable with the O'Kaysions in 1968. Pat Parker's version was probably the first of all to come, although Killette stated in an interview with Gary Myers that he recorded the original version on his Trail label in 1958. According to Killette, it sold quite well regionally but no copies have surfaced yet. The fact that he claimed Wayne Grey recorded "Spaceman's Guitar" for Trail (which is wrong, confirmed by Grey) adds to the confusion and leads me to the assumption that there never was a Trail version of "Girl Watcher." Pat Parker was around 15 years of age when recording "Boy Watcher" in 1962. There are two different versions recorded by her. The story told by Trail is that a Nashville producer took Parker to Nashville in order to cut "Boy Watcher." Accompanied by the Way Mates, this version was released in spring 1962 on the Skyland label out of Skyland, North Carolina (Skyland #1000). Killette didn't like the result and arranged another session for Parker, re-recording both "Boy Watcher" and "Warm Glow" and releasing it on the Heartbeat label out of Florida (Heartbeat #1000). This is the most probable course of action. Pat Parker's sister recalled that their mother helped Killette with writing "Boy Watcher" but got no credit for it. A similar case later developed with the O'Kaysions' lead guitarist Wayne Pittman. 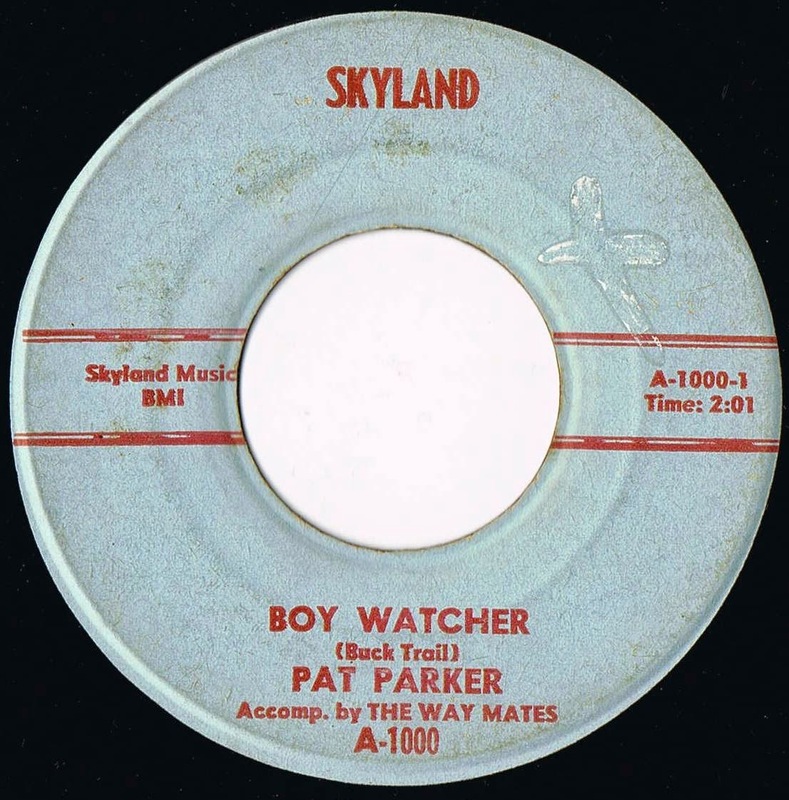 The flip side of Pat Parker's Skyland single, "Warm Glow," was penned by Pat, Mary Parker (possibly her mother) and one certain Genevive Angel. Pat Parker's Skyland version became a good seller in regional markets but didn't break into the national charts. She had a follow-up on the label, featuring "Date with the Blues" b/w "Young Sweethearts" (Skyland #1005), the lattet being also a Killette composition recorded earlier by Helen Thomas on Trail. Interestingly, another artist named Norm Mello cut two more Killette songs for Skyland. "You're Something Special" b/w "Beneath Miami Skies" were again both recorded earlier by other artists. I assume that Killette was somehow involved in this label but haven't found any proof yet. Hi Mellow. I enjoyed your articles on Pat Parker, Buck Jones & other Buck Trail related items. Thx for mentioning me. I've been in touch a couple of other collectors/writers who have done some work pertaining to Killette's songs, etc., & it appears that we're still turning up more stuff. I need to go thru dads records, I know I have all the way mates & pat parker, one with Bobby bare...plus some older recordings of my grandfather in his bluegrass band... how did you come across all this? ?